Around this time of the year – with all of the frigid temperatures and dark days and snow and healthier eating resolutions that follow after all of the holiday feasting – there is nothing more satisfying than a big pot of homemade vegetable soup simmering on the stove top! 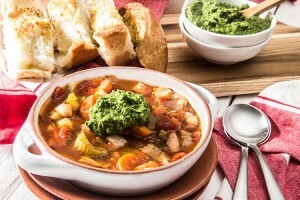 These days I’ve been making my own version of Italian minestrone soup with plenty of healthy veggies and cannellini white beans and topping it off with something that makes it extra special, satisfying, and delicious: pesto! I love serving it with plenty of toasted Italian or garlic bread, and it’s filling and satisfying enough for a (vegan!) meal. A homemade vegetable soup does require a day when I have a little extra time on your hands (this recipe takes about one hour in total). A big bowl of steaming soup fresh from the stove top is worlds beyond anything out of a can. And the wide variety of healthy ingredients in this soup (celery, carrots, cabbage, and white beans, along with arugula and sunflower seeds in the pesto) have me believing that a homemade soup has got to be one of the healthiest meals around! This soup holds up really well as leftovers too, so I love cooking this recipe over the weekend – then I have ready-to-go healthy lunches that can be heated in the microwave throughout the week. Heat 2 tablespoons olive oil in a large stock pot over medium-high heat. Add 2 cloves garlic, along with the onion, celery, carrots, and cabbage. Season with salt and pepper. Cook until vegetables begin to soften, about 5-7 minutes. Add Herbes de Provence, chopped tomatoes, and vegetable broth. Stir until well combined, and bring to a boil. Reduce to a light simmer, cover, and cook, stirring occasionally, until vegetables are softened and tender, about 30 minutes. Add white beans, stir until combined, and cook until heated through. Season to taste with salt and pepper. Add the toasted sunflower seeds, arugula, and ½ clove garlic to a food processor. Season with a pinch of salt and pepper and pulse until ingredients have become a puree. Add the olive oil and pulse again until oil is well combined. To serve: Ladle soup into serving bowls. Stir a dollop of pesto into each bowl. Storage: this soup holds up very well as leftovers heated in the microwave. Store soup in a covered airtight container in the fridge. Store pesto in a separate covered airtight container in the fridge. This looks so yummy. I have already tried bean soup but never with pesto. I will definitely try this one as well.